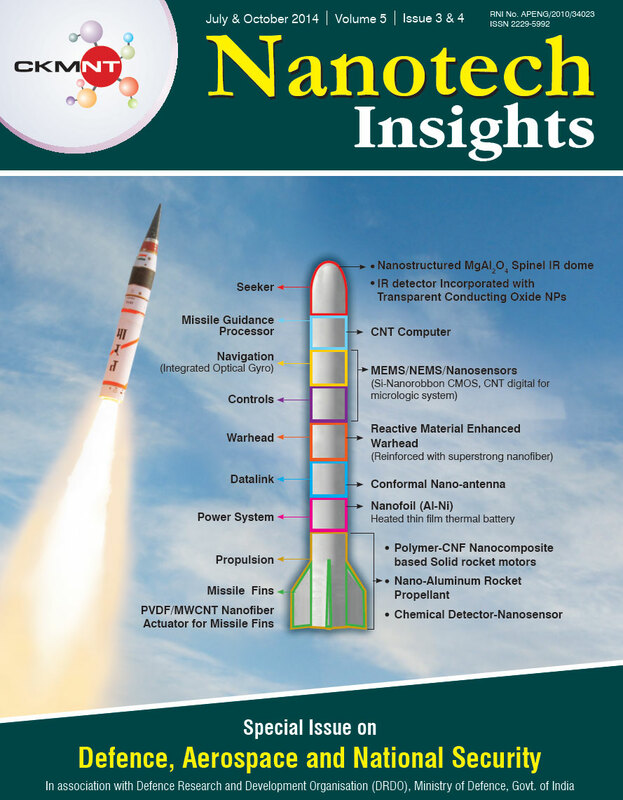 (Nanowerk News) Nanotech Insights, a quarterly newsletter dedicated to the field of nanoscience and nanotechnology, has released a special double issue on nanotechnology-related Defence, Aerospace and National Security. The special issue, which was compiled in collaboration with the Indian Defence Research & Development Organisation (DRDO), covers a broad selection of current topics ranging from active and passive countermeasures, nanotechnology-enabled sensors and actuators, aerospace nanocomposites, multifunctional nanomaterials and ceramics. It also addresses safety, environment and healthcare issues related with nanomaterials. 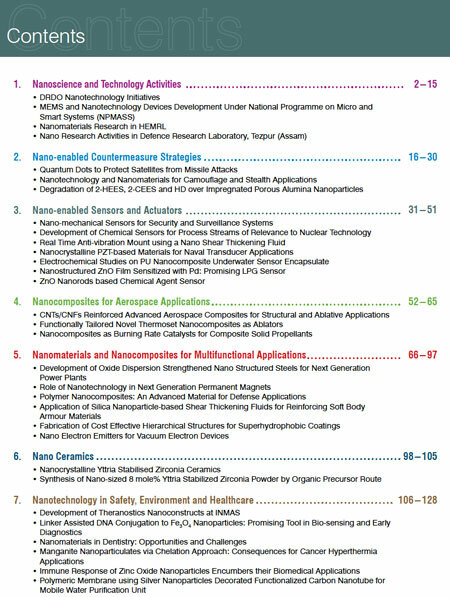 Chapter 1 includes a lead article by DRDO Headquarters, which presents a short overview of the nanotechnology initiatives being pursued at various DRDO laboratories. In addition, there are a few articles by individual Labs highlighting their thrust areas such as MEMS/NEMS and nanodevices; nanomaterials for propellants, explosives and pyrotechnic applications; application of nanomaterials for the removal of chemical and biological contaminants from water and development of nano-enabled approaches to deal with the health and hygiene related issues being faced by North-East region. Chapter 2 features various nano-enabled approaches to counteract enemy threats such as missile attacks on satellites; stealth and camouflage coatings to protect battle tanks and air vehicles by misleading enemy; and reactive adsorbents for chemical warfare agents to protect humans. The next chapter highlights the development of nanosensors for the detection of bombs, explosives, lethal toxic agents, etc. to protect our soldiers and human population from impending catastrophes likely to be caused by hostile action of our adversary or as an act of terrorism. Chemical sensors are also being developed to meet on-line monitoring requirements of nuclear installations. This chapter also presents development of nanofluid enabled anti-vibration mounts designed to protect naval equipments subjected to vibration and shock loading environment. The advancements in the area of nanocrystalline PZT acoustic transducers for anti-submarine warfare, mine warfare, countermeasures and signature control are also covered in this chapter. Nanocomposites are characterized by outstanding combination of mechanical, thermal, physical and optical properties. These attributes make them ideally suited for applications such as structural aircraft/space vehicles parts, high burning rate propellants for missiles, ablation resistant composites etc. Chapter 4 on “Nanocomposites for Aerospace Applications” articulates the key features and applications of this unique class of composites presented in a few articles. Chapter 5 deals with a variety of nanomaterials/nanocomposites for multifunctional applications ranging from high temperature ODS steels for power plants, nanostructured permanent magnets, shear thickening fluids for bullet-proof vests and so forth. Chapter 6 describes techniques for the synthesis of nanocrystalline zirconia ceramics, which find applications for solid oxide fuel cells and structural parts. Nanotechnology plays a crucial role in safety, healthcare and environment related issues. Chapter 7 dwells upon various uses of nanomaterials in dentistry, molecular imaging, cancer imaging and therapy agents, and nanocomposite polymeric membranes for water purification. Lately, unregulated and rampant use of nanomaterials has raised concerns of their possible adverse effects on environment and health, which emphasizes an urgent need for risk assessment and risk management. An article presents findings of a study that examines the effect of ZnO NPs induced immune response in lung epithelial cells. For obtaining a copy of the digital/ print version of this special issue, you may please contact either: H. Purushotham, at [email protected]/ [email protected] or Yashwant Mahajan at [email protected] .